Senior members of Egypt's Muslim Brotherhood have reacted angrily to statements by US Senator John McCain in which he thanked the group for its role in lifting the travel ban on indicted foreign NGO workers. At least thirteen foreign nationals, uncluding several Americans, out of 43 people accused of working in Egypt and raising US funds without appropriate government authorisation, departed Egypt on a US military plane on Thursday. The US government paid the $330,000 bail of all US workers who left Egypt. Freedom and Justice Party (FJP) MP Farid Ismail on Friday insisted that neither the Brotherhood nor its political arm the FJP helped lift the travel ban. Meanwhile, Brotherhood spokesman Mahmoud Ghazlan said the case brings Egypt's sovereignty into question. Both men were speaking on the Akher Al-Nahar programme on the Al-Nahar satellite channel. McCain said, "Last week in Cairo, we had meetings with the speaker of parliament and other newly elected parliamentarians from across the political spectrum, with leaders of the Muslim Brotherhood, and with Field Marshal Tantawi and other members of the Supreme Council of the Armed Forces. These meetings reassured us that people of goodwill in both countries were working diligently to find a positive resolution to the recent crisis. "We are encouraged by the constructive role played over the past week by the Muslim Brotherhood and its political party, the Freedom and Justice Party . Their statement of February 20 was important in helping to resolve the recent crisis." 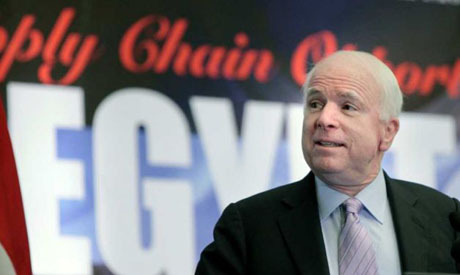 McCain visited Egypt on 20 February in an attempt to resolve the case involving US NGO workers. During Saturday's first joint session of parliament, People's Assembly speaker and FJP MP Mohamed Saad El-Katatni condemned recent developments in the NGO case. Judicial decisions should be made without political interference and attempts to breach national sovereignty would not be accepted by parliament, he said. El-Katatni noted that a US plane arrived to repatriate foreign NGO workers before the travel ban was lifted. Among the groups under investigation are the US-government funded National Democratic Institute (NDI) – founded by former secretary of state Madeleine Albright – and the International Republican Institute (IRI), whose chairman is Republican Senator John McCain. Both organisations are affiliated with the two major political parties in the United States. Both the NDI and the IRI receive most of their funding from the US Agency for International Development (USAID), the US State Department, and the National Endowment for Democracy. How naive are people who honestly believe the US are REALLY fighting for "democracy"! The US - in the footsteps of their ally, the UK, former big holder of a colonial world empire - behind this "democratic" mask, is nothing but a huge superpower using any tricks and devices - wars included - to impose its rule over as many countries as possible. And the ones which resist are immediately declared "ennemies of democracy", "harbouring terrorists" - everybody knows the language used... I am a "neutral" Swiss and see everyday - though the banking links - US imperialism at work. No offence, but the trouble is that colonised countries are always the naive ones, the colonisers are the most experienced in exploiting the naivity.